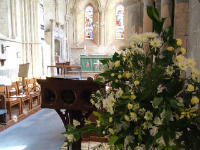 Both All Saints’ and St Mary’s have excellent teams of flower arrangers who decorate the churches beautifully. 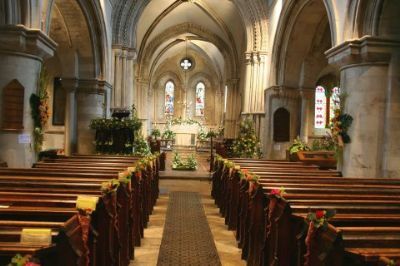 We have heard from Rev Tara, that the decorations for the church over Christmas were well received. We again used the garlands we bought last year, and decorated them with Poinsettia flowers, Cinnamon sticks, dried oranges and red ribbons. Instead of putting the garlands around every pillar, as we did last year, we stretched out two of the garlands and draped them from middle pillar to pillar. In the windows we placed large branches of fir- kindly donated by one of our arrangers - bound with ivy and holly and again huge bows of red ribbon. Everyone worked very hard, and nearly all our flower arrangers joined in in some capacity - even the very important task of making us all coffee and providing wonderful biscuits. We also had some new people join us, which was terrific. So lets hope they enjoyed it enough to stay on ! !